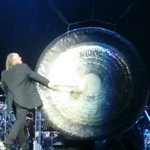 Bill Bailey is a musician who happens to be rather good at comedy, and his Remakable Guide To The Orchestra at the Royal Albert Hall had almost near perfect reviews. I missed that performance, but thankfully I got tickets for the O2 show. 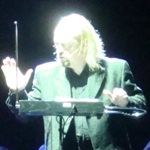 WIth an excellent view just a few rows from the stage, Bill Bailey entered the arena, supported by the BBC Concert Orchestra, accompanied by Academy Award winning conductor Anne Dudley. It was immediately evident that this was going to be a good night. An educational experience expertly expressed using comedy and music. Many have attempted musical comedy in the past, but few succeed in getting both aspects right. 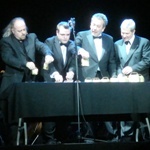 Bill Bailey manages to combine the elements superbly, and in doing so, is able to put together a master class performance. 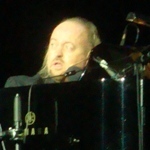 Bill Bailey covered music from 70s cop shows including Starsky and Hutch and news themes including ITN News. He managed to pull off the Dr Who Theme Tune slowed down as Belgian Jazz and Match of the Day as a Jewish Folk Song. He showed how Bassonists had an urge to play Bee Gees tunes at all times and how Trombones play a part in Cockney music. He even managed a great musical routine with Insect Nation. The array of musical instruments on show was a pure delight, from the usual suspects like the Guitar and Piano to the hilarious off-the-wall routine utilising the Alpine Bells. The audience was in full admiration of Bill Bailey and there was a great rapour between the two. Bill Bailey is a genius in his genre. The best advise is to buy it on DVD/Blu-ray, of which I have already done. It’s interesting, fun and remarkably clever. Considering it’s educational too, maybe it should form part of the musical curriculum at schools too!